The Memphis Police Department are still investigating the tragic death of former NBA player Lorenzen Wright. The majority of that investigation has been targeted toward his ex wife Sherra Robinson Wright. Wright who has not been cooperating with the police since she was questioned a few days after the murder has not been charged or accused of anything. Miss Wright did however talk to police in detail a few days before Lorenzen’s body was found. He returned a short time later then left a second time with cash, she said. Her account to police came five days after his mother reported him missing. Sherra Wright told detectives her ex had a conversation on “a ‘tracfone’ or similar cellular telephone” with an unidentified person before he left with the drugs and money. She also told police he owned an iPhone and made calls from both cells while at her house. 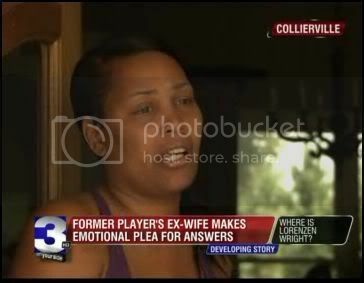 “During the conversation with the unidentified individual, Sherra Wright told Det. Young she heard Lorenzen Wright say he was going to flip something for $110,000,” according to an affidavit obtained by The Commercial Appeal on Tuesday. Lorenzen Wright left the Collierville home on Whisper Woods Drive in a vehicle driven by an unidentified person shortly after the call, she said. Sherra Wright told police her ex-husband owned two guns, a shotgun kept at her Collierville home and a handgun kept inside the family van. Collierville police searched the home and van but didn’t find the weapons. The police have not recovered the guns or the cell phones. On the advice of her attorney Miss Wright has decided not to give any more statements to police. If you take the statement at face value Miss Wright is insuitating that this was a drug deal gone wrong. If you don’t take her statements at face value then it sounds like a convenient excuse to take the spotlight off of her. The Memphis PD are taking their time to make sure when they do make an arrest they arrest the right person or people responsible for the crime. As more details arise we will keep you informed.